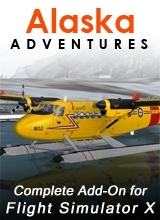 Alaska Adventures adds twelve new missions flying in Alaska and Canada. The primary aircraft is the DC-3, in both cargo and passenger varieties, on wheels and on skis. 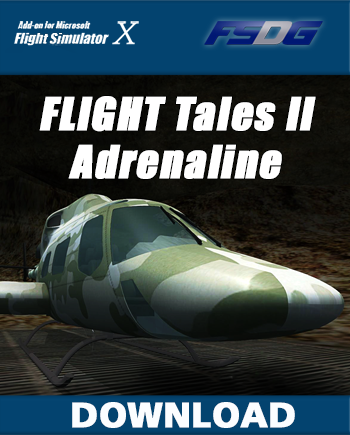 Bonus missions offer the Grumman Goose and the DHC-2 Beaver. 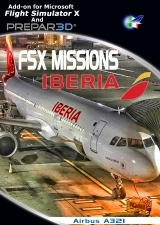 10 missions are flyable with the standard FS X version, and twelve with the Deluxe (Pro) version. Mission complexity has increased a notch with this release, with many more random variables and player choices. Moreover, failures are randomized and range from simple magneto or vacuum system problems to full blown oil pump or engine failure. The Canadian West coast is renowned for its rugged beauty and variety of climate zones. We have added scenic detail around many locations. Air traffic control is limited in many coastal areas, and the remoteness of locations adds to the challenge. Similarly, Alaskan scenery is rugged and beautiful. 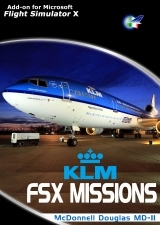 Missions include dusk and dawn flights in three different seasons to and from famous locations like Fairbanks, and Juneau and Skagway in the Klondike. This release recommends the download of the AWESOME 4SOME, the beautiful DC-3 package by James Eden and Jon Murchison. These modelers have added the Viewmaster variant, the LC-47 and the cargo variant with wide doors, and skis have been added for landings on frozen northern lakes. Additional features accrue to each of the new aircraft, and of course there are new liveries. Missions include new scenery, a variety of voices, and new livery for the DC-3. Canadian locations include Burwash and Whitehorse. 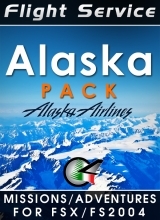 Alaska locations include Skagway, Anchorage, Nome and more. Mission types include search and rescue, transport, homeland security and ferrying cargo and passengers. All types of weather are included, as well as emergency situations. 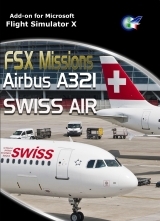 On screen mission goal markers are available for most missions except Advanced missions.